Ques: I will start with a question a lot people asked you already: why are you doing this? Why this interest on the Albanian organized crime, not as such, but as a way to show people the misery of it and try to prevent the youth from slipping into this kind of life? Somehow, the reporter and social worker are mixed together, aren't they? Ans: Yes, you're completely right about that mixture -- I feel the pain of Gjoka devastated by the loss of his girl the singer Anita Bitri; I feel for that young girl just arrived from Albania working in the club in Detroit, tired and wants to go back home; I feel for that broken hearted aging Albanian Mom whose son, a defendant, who she and her husband love so much, has to sit through trial and hear all these horrible things and doesn't even understand what's going on in court and I try to explain it to her because nobody else is; I feel for the guys who had guns at their heads and had to beg for their life; I feel for the guys , the guys who used to be house painters, pizza shop workers, construction workers who went criminal and now have to spend the rest of their natural born life, no chance of freedom in a cage in prison; I feel for how they bullied and hurt and killed each other so cold-bloodily. I think every person probably deserves their own Wire (very authentic and good TV show). The small fries, the wannabes, the kingpins, the group of guys, the gangs, the crews, the friends, the ethnic partners, the mob, the mafia. They merge, morph, combine and dissolve so much it doesn't matter. The scholar measured it in weight moved and assets. On the many many crime forums they do the who would win game: the ninja or the Hun; Godzilla or the Thing; the Hells Angel of the muscles from Brussels . Except it's with Crips vs Cartels vs Albanians vs. Russians vs. the Chinese. The people I know in US (except for some involved in the crime and law enforcement world) -- they know really nothing about Albania; the people from Europe only have some stereotype -- that Albanians are bad for their country (Germany, England, Greece, Italy, etc) when they come in, cause, do crime. I wanted to tell the authentic story, as much as I can, who these people really are, not stereotypes. Ques: What's the most striking feature of the life you have reported on and of the bad guys you have met? What impresses you the most? Ans: Two gangs who used to work together broke up, a fight, they went to war -- Group A at one point had guns pointed and were about to kill a rival and the leader couldn't go through with it, he couldn't shoot, he ordered his boys not to shoot -- he remembered when he used to be friends with the rival guy, how they were brothers, what they did together, the times they shared. Group A gang members called him too soft, they were disgusted in him, he in himself for not pulling the trigger. Those same rivals, a short time later found one of those guy from Group A, best friend of the leader who couldn't pull the trigger earlier -- they shot that best friend to death -- it made Group A fall to their knees, cry, go to church. Ques: There is a point to be made when it comes to calling the Albanian thugs and crooks Albanian Mafia. 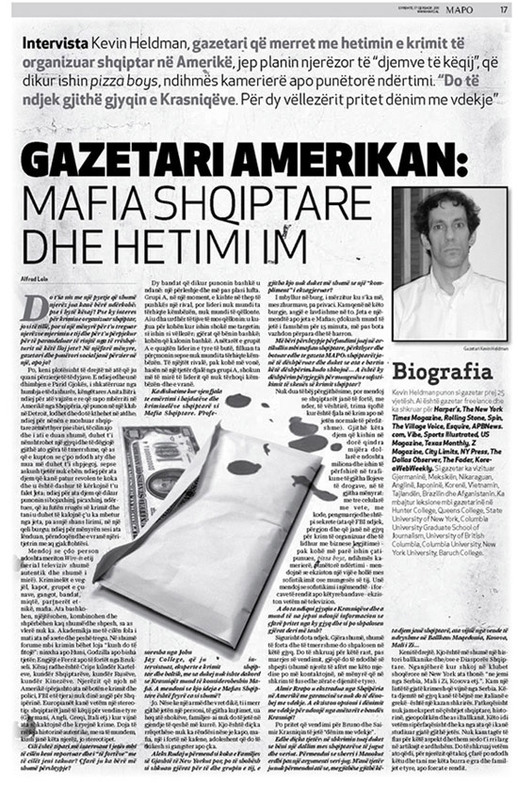 The John Jay College professor, an expert on Albanian and Baltic crime seemed to disagree on the fact that Krasniqi's for example could be considered Mafia. Do you thing this Albanian mafia thing is blown out of proportion? Ans: No, if you have a gun and kill someone you take away a person's whole life, all his memories, take him away from his friends, family -- he'll never be able to laugh again. That's powerful -- it doesn't matter if you're a kingpin, Mafia, tough guy in the coffee shop, teenager trying to be gangster, wannabe. Ques: Alex Rudaj was mentioned as the head of New York's Sixth Family but seeing the way things have gone for him and his crew the whole thing doesn't seem more than a flattery? Ques: I was impressed by the conclusion of your article which we translated and published at MAPO: the Albanians are desperate and they seem to carry their desperation wherever they go... Does this desperation count for the lack of sophistication of the Albanian crime scene? Ans: I don't mean to generalize but I think Albanian people are strong, honorable, tough, brave (when it comes to crime or nothing to do with crime) and all these guys who got into hundreds of thousands of dollars maybe millions and were involved with all kinds of drug operations, carrying 3 cell phones, using codes and kidnapping and safe houses (the guys who the FBI is chasing, wiretapping, using intelligence analysts for 5 years to look at) and who are on Federal trial as mafia Organized Crime) and connected to legitimate businesses -- they were a short time ago roofers, worked in pizza shops, busboys, did construction -- think there's thin line between sophistication and not sophistication -- I think real sophistication -- law enforcement or these gangs - - is only on TV. Ques: Will you be attending Krasniqi's crew trial and can you give us some insight as what is to be expected from this trial and how are things unfolding so far? Ans: I will attend -- very very powerful, sad, horrible things are going on, coming out at trial -- I'll write about this case after the verdict, which will be soon (many people who know this world are contacting me now so I can get their voices and insights in). Then I'll attend the Krasniqi trial and write about that. Ques: Almir Rrapo was extradited to the States with guarantees of not getting the death penalty? Is death penalty on the table for any of Krasniqi's crew? Ans: Yes, Bruno and Saimir are facing the death penalty. Ans: You're right -- this is more of a Balkan story, and/or an ethnic Albanian Diaspora story -- sometimes when I go into these social clubs in NYC they say "we're from Serbia, Montenegro, Kosovo, etc " I have a whole list of on-going mafia crimes coming out of Serbia. And these guys on trial deal with Italians and Greeks -- it is a melting pot. Unfortunately I'm not an expert on Albania, the history, the geo-politics or on the Balkans. This part I know only superficially and there are those who have studied it their whole lives. I don't have the standing to speak on this aspect and I think I'll stay away from that in future articles -- I'll just write what I know, the people I meet, what's going on here and now with these men and women and their families and law enforcement.